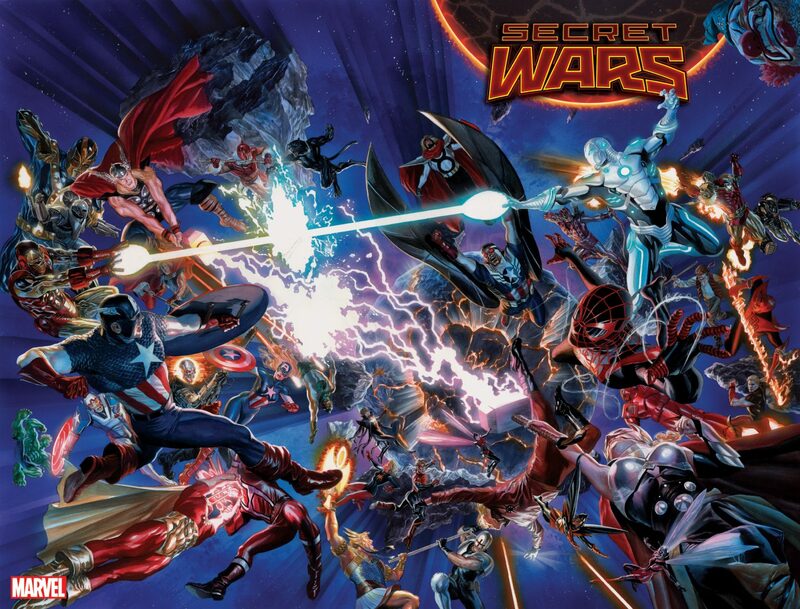 Secret Wars Update: What do the sales say so far? – AiPT! Secret Wars Update: What do the sales say so far? My favorite part of our big discussion on all things Secret Wars back in May was the sales talk. Not that I wasn’t looking forward to the story itself. I’m reading and loving it, along with a good chunk of the supplementary material. But let’s face it; this whole initiative was a huge publishing risk. Despite Marvel Editor-in-chief Axel Alonso’s continued insistence that all these weird stories will “count,” many fans claimed to still see them as What If? titles that are eminently skippable. And with nearly every regular title being on hiatus to make room for the Battleworld landscape, that could have been a monumental problem. So two and a half months later, has it been? Let’s take a look at the numbers to see what adds up, then we’ll hear from some of the retailers that are actually down in the trenches. According to Diamond figures (which estimate the number of issues sold to retailers in the direct market channel), Secret Wars #1 sold somewhere north of 525,000 copies in May. That’s a far cry from the Loot Crate-assisted million-plus of Star Wars #1, but well ahead of Marvel’s typical events, which usually debut around 150,000 copies shipped, and even the post-Superior relaunch of Amazing Spider-Man, which topped out near 300,000 copies. And it had better have done that well. No story has had an advertising campaign and multi-platform merchandise roll-out as big as the ones for Secret Wars, ever. The trick then is to keep people hooked after curiosity brings them to the dance. How many of those half-million readers has Marvel kept? Retailers have been burned before, so they nervously only ordered 200,000 copies of Secret Wars #2, which shipped just a week after the premiere issue. There’s obviously no way to adjust orders on such short notice, so a lot of people understandably hedged their bets. But the Diamond numbers for June are now available, and they paint a pretty stark picture. Secret Wars #3 actually sold about 8,000 more copies than the previous issue. Even more surprising, retailers also asked for 8,000 more copies of Secret Wars #1, with another 5,700 of #2 for good measure. That’s highly unusual. The reorder bonanza hasn’t been limited to just the main title, either. According to Bleeding Cool, Secret Wars tie-ins were already dominating advance reorders by the end of April. In other words, retailers had underestimated consumer demand for the books and were scrambling to get enough stock to accommodate. For that time period, 20 of the top 25 hotly desired titles were connected to Secret Wars. That trend’s continued ever since, helping A-Force #1 scratch at 115,000 copies sold in May, and thrusting Amazing Spider-Man: Renew Your Vows #1 over 200,000 in June. I caught up with Peter Dolan of Middletown, N.Y.’s Main Street Comics again to find out if what he saw in person matched what we’re told on paper. As we reported on May 1, Dolan went all in on Secret Wars and its tie-ins, banking on good word of mouth. He hasn’t been disappointed. And they’re loving lots of different parts of it. Dolan said that tie-in mini-series like Old Man Logan, Planet Hulk and Future Imperfect are also doing exceptionally well. What’s more, those books have even inspired sales of the original material with those names, specifically Mark Millar’s Logan and Greg Pak’s Hulk. “We’ve been selling a lot of those trade paperbacks,” Dolan said. “I’m selling the stuff incredibly well,” Giacoia said. That includes reorders “too numerous to mention,” covering the same ones as Main Street Comics and others like Civil War, Thors and even Squadron Sinister and Weirdworld. The two owners were split, though, about the several-week delays that are starting to hit a lot of the series. Nevertheless, both men were confident that things would continue strongly into Marvel’s October relaunch, although Giacoia was concerned after many of his regulars used DC’s Convergence as a jumping-off point for that brand. Dolan says that many of his customers, rather than looking ahead as a lot of people tend to do halfway through a story, are so engrossed in Secret Wars that they’re not talking much about the future yet. Still, he believes the good will earned this summer will continue through the relaunch this fall. “I think people are willing to trust that once this is over, what comes next is going to be equally compelling,” Dolan said.